Born and raised in Japan, Katsu started piano lessons at the age of five and later studied oboe performance with Man Ichihara. 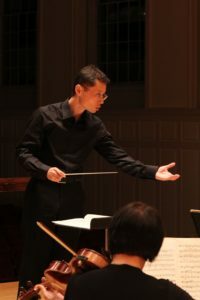 After playing the oboe in an orchestra for eight years and gaining some experience with choral conducting in Japan, he moved to the US nine years ago. As an oboist, he has worked with such distinguished conductors as James Lockhart, Ken-ichiro Kobayashi, Kazuki Sawa, and Kazuki Yamada. He has studied conducting with Maestros Peter Fender, Martin Akerwall, Frans Rasmussen, Diane Wittry, Christoph Rehli, Kevin Suetterlin and Lior Shambadal, and has conducted South London Sinfonietta (UK), Pazardzhik Symphony Orchestra (Bulgaria), State Philharmonic Orchestra "Banat", Timisoara (Romania), and the Moravian Philharmonic Orchestra (Czech Republic). In July 2018, he conducted the Russian premier of Ballata Sinfonica by Akira Ifukube with Youth Symphony Orchestra of Saint Petersburg. While his repertoire spans from classical to modern, he has special interest in American, British and Russian instrumental music from the romantic and early 20th century periods.